Felix Blumenfeld (1863-1931) was something of a polymath and pioneering spirit; the Russian pianist, conductor, composer and teacher mirrored in many ways the qualities that led to the successes of his rather better-celebrated friend Sergei Rachmaninov. Blumenfeld headed a flourishing chain of musical giants that started with his nephew and pupil, Heinrich Neuhaus, and culminated with the likes of Sviatoslav Richter and Vladimir Horowitz. When we glibly talk of the Russian school of pianism and its stunning capacity to stimulate individuality, it is to luminaries like Blumenfeld, Feinberg and Goldenweiser that we need to be doffing our caps. Yet we must also recognize the enormous influence of Rimsky-Korsakov, who taught composition to Blumenfeld in St Petersburg; it was under his tutelage that Blumenfeld would become noticed by Belyayev, a much lauded and prominent figure without whose endorsement wider acclaim would have been an uphill struggle. 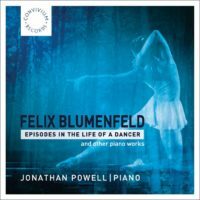 Blumenfeld¹s compositions for the piano run into three figures, and on this recording made at Durham University in 2008, Jonathan Powell selects six sets of pieces plus the Nocturne-Fantaisie, the earliest work on the disc despite being penned in the composer¹s early thirties. The music is high-octane Romantic, with comparisons easily made with Rachmaninov and Tchaikovsky, but there are many individual flavours to savour too, and it is surely these that attract Powell, whose CV tells of many appearances as recitalist and concerto soloist, especially in Eastern Europe. The unidentified writer of the booklet notes (whom I am sadly therefore not able to congratulate or thank for several of the details I¹ve hitherto outlined) concentrates almost exclusively on the man, not his repertory, and in a sense this better equips the listener to arrive at personal judgements about the worthiness of the music. The Nocturne-Fantaisie, just shy of ten minutes long, is a fulsome and intense piece, and the weightiness of the material immediately draws us into Blumenfeld¹s orbit, where the whole keyboard is in play for much of the time and a conspicuous degree of pianism is needed to meet the challenges head-on. There are occasions, I would suggest, when the bravura passages become a little self-serving, but these are largely balanced out by the grande ligne that threads through the work as a whole. One is carried along by the splendid harmonies and sparkling flourishes, though the music is certainly not devoid of poetry. The Sonate-Fantaisie, Op. 46 written in 1913, is, if anything, even more stirring and ambitious, although one wonders just how the composer will be able to sustain the succession of near operatic climaxes, having reached several apotheoses within the first third of this single-movement piece. It is to Powell¹s credit that he grapples with the virtuosic passages so manfully but also teases out the moments of reprieve with patience and poise. Some of the more attractive music included is to be found in the Episodes dans la vie d¹une danseuse, Op. 52, three short and by no means easy pieces, dedicated to Horowitz. This is a wonderful set, written in the composer¹s later years and reflecting much sophisticated romanticism ­ it quite justifies its position as the title work for the album. Powell is on stupendous form in this piece, pushing on through the highly complex passages with great stamina and pulling out some extraordinary effects with the fingers and pedals. I also draw your attention to the Deux moments dramatiques, Op. 50, which again have immediate appeal and show the composer at the peak of his maturity, with moments of impressionism intertwining with the bolder gestures that inevitably win through; the Presto is alarmingly devilish to play but a sheer joy to behold. The sound on the recording is very good, and Powell (who produced the disc) is to be applauded in conjunction with Adaq Khan (engineer and editor) for achieving just the right amount of bloom and edge. International Record Review was an independent British monthly classical music magazine. First published in March 2000, and defunct by April 2015 according to its website, the magazine reviewed classical music CDs, DVDs and books.